I think that enough time may finally have passed to make a thread reflecting on the (admittedly few) good things KK2 brought us. I'll say a few of the more commonly remembered ones in my post, and then anyone else can add things (mainly new parts) that came from KK2 and why they consider them good additions to the castle line. The foremost posetive about KK2 in almost everyone's opinion has to be the Shadow Knights. The face (while sadly Identical across all sets) was cool, the torso stands toe to toe with most of it's predecessors, and the helm is a usefull and viable addition to the castle line. They were easy to get in large quantities, and brought with them a huge supply of black spears and axes, perfect for anyone trying to standardize their armies' weapons. I would also put forth the Heman swords (the silver ones mainly, the gold and bronze were mildley usefull, but the red blue and yellow stunk) as a posetive, them being to date the only other greatsword than the chrome silver ones. It may be a bit overly streamlined, and it's certainly no replacement for our classic shortswords, but it did add some sorely needed variety to castle weaponry (which hadn't recieved any additions since 1995 at that point). They are good for high ranking soldiers who fall short of being heroes, or at least that's how I use them. all in all they did provide us with some good parts. I must say, I rather like the breastplates and Santis' grey visor. Aside from the stuff already mentioned by Elbadar and lord_of_orks, the rest of it is pretty much crap. Oh yeah, and King Jayko's shield...I like that too. But even I must admit the later years of the theme had a few decent sets, soldier minifigure (not knights) design, and shields. Yup. I'm sort of glad that KK2 only lasted 2 years. I like the stuff that came out afterwards. Euro Armor, the Scorpion faction, and some of the "good guy"
structures weren't bad, it was all sort of misguided, and the Jelly Bean Knights didn't help the situation. I also didnt like the fact that they "promoted"
mind the two bad knights that opposed them. There were a few nice bits. Wasn't this helm introduced in KK2? Jelly bean knights were pretty horrid, but I've seen Rascus used well for Gawain and the Green Knight MOCs. We should also point out that KKII brought back the castle theme after a three year hiatus (okay, during that three year break we got some great things like the Siskind Blacksmith and the two Legends sets of the BFF and Guarded Inn, but no mass-marketed line). Bruce N H wrote: Wasn't this helm introduced in KK2? yes, that was the original shadow knights helm. You know I hate to say it because I was a great proponent of how horrible KK2 was but alas I have fallen in love with the latter half. Battle at the pass has already been talked about which I believe was the best set of the line. I also like the Gargoyle bridge true the axes are slightly misplaced and not that useful but I like the bridge (better than the fantasy tower, a tower that looks like a bridge but does not go anywhere, or the royal knights bridge which is rather bland with features). I like the Rogue knight battleship as a small battleship that is larger than the older rowboat ships which also came with speckle armored mercs. I even like the Lord Vladeks Castle which is dark and foreboding with a few amenities to it, being 1 of 2 castles for back guys (Fright Knights does not count considering it is not nessesarily a bad guy castle nor would it stand up to an assault) honestly in my opinion the best bad guy castle to date. I own the Troll Mountain Fortress and it does not really stand out as a good castle unless added to. I even like all of the figures of the later KK2 like sir Kentis and Sir adric and the merceneries. Really my big beef with the line would have to be with the earlier portions (The buildings and the Knights). That being said though I am not nessesarily strictly classic castle. 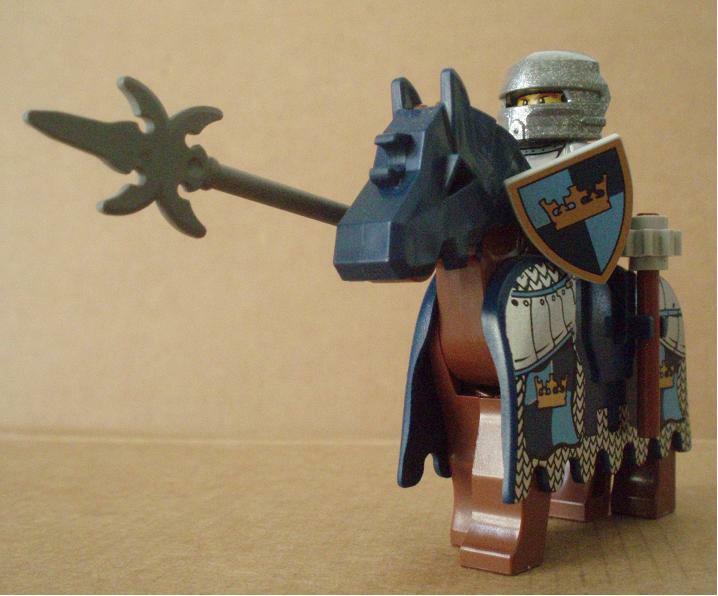 I love history of and the periods which held the knight however I am generaly more into the fantasy era so KK2 does not really stretch the look that I am going for like some others who are trying to keep a historical aspect to there legos (which I commend them for by the way but am to lazy to try) . What bothered me most about KK2 as a line was how bare many of the interior structures were, or how open the defensible sections of castles were. There was also a lack of useful brick-based elements in many of the sets, and too many large scale "cheater" parts or Bionicle-style parts. I just wasn't enjoying the sets as much, either in building them or looking them over. The colors aren't so much of a terror to me, though the bright knight armor was a bit more like clowns, and the Zwords were okay as long as the colors ranged into the metallic hues, I think the Zwords bothered me more in the Vikings series as a true Viking sword would NEVER have a downward turned crossguard or a blade of that shape. The rest of the line was not too bad, but also very little of it makes me nostalgic. I might just be too old for KK2 at the time of it's release. If you ask my son, he might have a different response. I wonder what he would have said about my Yellow Castle had he grown up with it instead. Wow, a love-fest for KKII... never thought I'd see the day! My main complaint with the last three shields is that the animals are not outlined in black, making them less bold and dynamic. I must also say I'm not much of a fan of the rectangular shields, as they appear too cartoony to me. But for me, the variety in shield design allows a lot of possibilities in creating custom factions. Specifically, it has allowed me to create a 10-faction jousting tournament MOC that does NOT contain 4 Lion factions and 3 Dragon factions Also, these shields are not too terribly difficult to collect, and when combined with the Harry Potter shields from around the same time, allows the imaginative builder quite a lot to work with. Finally, I will say that the colored armor bits have come in handy as well when creating custom factions (though used a bit more subtlety than seen in the Jellybean Knights). But, with the exception of Vladek's visor, I find the rest of the over-sized visors ugly and useless. No need for me to go into the bad stuff. That would take too long, and this thread is about the good stuff, anyways. Next would have to be the Rouge Knights, from the third wave. Even though the had a lack of pants, I quite like them. They gave me a use for that set of yellow dragon plumes I have had for ever..
Vladeks fortress. Big, scary castle. Lots of nice parts, some nice figs. Really, the Shadow Knights themselves are just awesome. They were my first large army, thanks to that chess set. Those would be the highlights for me. There might be a couple other things, but not as big as the ones above. Last edited by Elephant Knight on Wed May 25, 2011 3:05 am, edited 1 time in total. I think you meant like I just couldn't resist the chance to say that. I would also point out vladek and kentis' helmets as being pretty useful to add variation to lego knights (although I tend to use Vladek's helmet for supernatural evil things). King Mathias' torso was a valid faction torso, albeit hard to amass in number, and his sheild (the white and blue diagonal striped one) is a great and kinda realistic castle sheild. I think the KK2 introduced horse helmets are very useful as a replacement for the dragon knight ones we had had up til that point. I find that in every stage of kk2 the red and green euro armours were consistently useful (provided you switched out the aweful Santis and Rascus helmets). It is also worth noting that KK2 was (along with the vikings) the origin of the speckled silver euro armor, which happens to be one of my favorites. With the exception of battle at the pass, I generally write off the set designs as worthless, but there were many small ones that offered decent parts/figures value. I would also like to say that the large poseable knights were useful for...... ABSOLUTELY NOTHING! . After writhing a paragraph about the posetives of KK2 I needed that. Elbadar wrote: I would also like to say that the large poseable knights were useful for...... ABSOLUTELY NOTHING! While I would tend to agree that they were mostly useless, they aren't completely useless. Greenglo used some of the KK2 armor parts in his ogre for CCC VI and it turned out amazing.